At the end of the Thanksgiving holiday weekend, it’s no surprise that the latest “Hunger Games” sequel “Mockingjay Part 1” came in #1 at the box office. The film pulled in $56.9 million this weekend (-53.3% from last weekend). Its totals now stand at $225.7 million domestic, $254.4 million overseas, and $480.1 million globally. 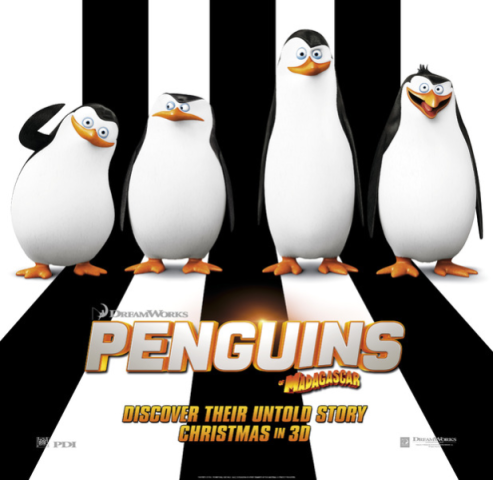 In other news, “Penguins of Madagascar,” the “Madagascar” spinoff, came in second place, earning $25.8 million. Its totals since opening last Wednesday is $36 million domestic, and $62.6 million overseas, for a global total of $98.6 million. While it’s a slight rise from “Rise of the Guardians”‘s mediocre Thanksgiving weekend performance a few years ago, and it has stiff competition, it’s still another lackluster DreamWorks film debut. Some were counting on this one doing much better, given it’s based on a familiar and popular franchise (versus “Mr. Peabody and Sherman,” “Turbo,” etc.). Of course, ultimately it might not matter what it brings in domestically—overseas is where the vast majority of “Madagascar” films’ box office comes from, and they’ll turn out en masse for the waterfowl. Dreamworks also has “How to Train Your Dragon 2” to crow about for a successful film from this year, which ultimately earned $618.8 million globally. Coming in third place is “Big Hero 6,” earning $18.8 million, down by a surprisingly small 6.7% from last weekend. So far, it’s earned $167.2 million domestically (matching its $165 million budget), $56.9 million overseas, and $224.1 million globally. Despite running for a month already, it’s managed to mostly hold off “Penguins.” Both “Penguins” and “Big Hero 6” should be fine for the next several weeks, until the next batch of family-friendly films open (oddly, all clumped together). “Interstellar” came in fourth place with $15.8 million (+3%). So far, it’s earned $147.1 million domestic, $395.2 million overseas, and $542.3 million globally. “The Theory of Everything” came in seventh place, earning $5.1 million (+236.2%, expanding to a lot more theaters). The film’s so far earned $9.6 million. “Gone Girl” came in eighth place, earning $2.5 million (-12.9%). It’s earned $160.8 million domestically, $173.4 million overseas, and $334.2 million globally. Finally, “Birdman” stayed in ninth place, earning $1.9 million (+1.4%). Its totals stand at $18 million globally, almost all of that from North America. Oddly, next weekend sees absolutely nothing opening in wide release; I gather this means similar box office figures next weekend as this weekend. For some reason, the studios decided to release a lot of their films up against each other later on in December. The weekends of December 19 and 24 are especially crowded, with films going after similar audiences and against one of the year’s biggest box office draws, the next “Hobbit” film. I have no idea why they’d make such scheduling decisions.